We describe a technique for constraining macroscopic fluctuations in thermodynamic variables well-suited for Monte Carlo (MC) simulations of multiphase equilibria. 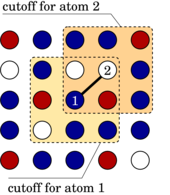 In particular for multicomponent systems this amounts to a statistical ensemble that implements constraints on both the average composition as well as its fluctuations. 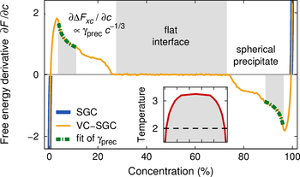 The variance-constrained semi-grandcanonical (VC-SGC) ensemble allows for MC simulations, in which single-phase systems can be reversibly switched into multiphase equilibria allowing the calculation of excess free energies of precipitates of complex shapes by thermodynamic integration. The basic features as well as the scaling and convergence properties of this technique are demonstrated by application to an Ising model. 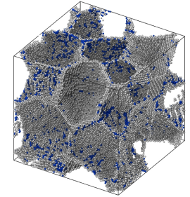 Finally, the VC-SGC MC simulation technique is used to calculate alpha/alpha’ interface free energies in Fe-Cr alloys as a function of orientation and temperature taking into account configurational, vibrational, and structural degrees of freedom.